Teenage girls, take note: an all-new Volkswagen Jetta is here. Actually, it was here a couple of years ago, but this blog wasn’t. Not that it matters, because there aren’t any teenage girls reading this. Actually, no one is reading this except my mother, who occasionally sends hate mail. Anyway, the new Jetta is here, and – as a highly qualified automotive blogger who has seen a few of them on the road, or at Avis lots – I’ve decided I’m more than capable on providing a full and honest review. When I was younger, Jettas were really cool. Well, no, come to think of it, they were mostly Brazillian-built crap. But that changed with the fourth-generation Jetta (or, in 1337 speek, the MkIV) which came out in 1999. That one actually was cool, and, as I recall, it was the “it” car for girls in their teens, girls in their early 20s, girls in their late 20s, and men who were confused. The same was true of the next model, which came out in 2005 and inexplicably used a five-cylinder engine. But the coolness is gone from the latest Jetta. From just about any angle, it looks like an amorphous blob styled by people who were apparently tasked with averaging out the lines on every other sedan sold in the last decade. Normally, this is where I’d provide some platitude about one single aspect that looks particularly nice, but there are none – a fact I’m sure of after visiting my local Hertz, where the Jetta has been the featured car of the week for the last sixteen months. Worse, the latest Jetta has lost its appeal to young, attractive women who seem to always be in workout clothes. Last week, for example, I saw a man driving one, and he didn’t even look confused. 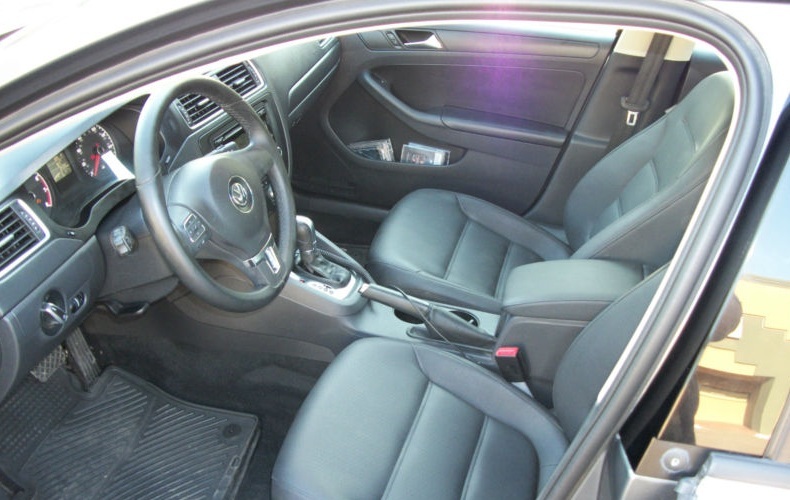 Based on photos I’ve seen on eBay, there are many positive aspects about the Jetta’s interior. For example, if you work at a plastics company, it provides job security. If you own a supplier that specializes in boring, clearly-labeled gray buttons, you’re probably reading this from Hawaii. And if you’re an automotive industry consultant who trades in inoffensive blandness, you’ve probably been promoted after the heroic job you did making sure not a single iota of interesting found its way into the Jetta’s interior. But what the hell do I know? I’ve never even sat in the car. It’s often difficult to write this portion of the Car Review Without Actually Driving It, since – as the title vaguely implies – I’ve never actually driven this car. But for the Jetta, it’s easier than you might think. The car is bland on the outside, and it’s bland on the inside. My money says it’s not exactly going to be a hoot to drive. That viewpoint is cemented by the fact that the base engine in the Jetta is a 115-horsepower 2.0-liter four-cylinder. That’s the very same engine that was the base engine in the 1994 Jetta, which I may have earlier called “Brazillian-built crap.” And while nobody probably actually gets this version, the fact that they offer it at all demonstrates Volkswagen’s deep commitment to removing the driver from the driving experience. Plus, do you really think stepping up to the 150 horsepower five-cylinder is going to transform it into an excitement machine? I highly recommend the Jetta to most people. Yes, it’s bland; yes, it’s boring; yes, it might lose a drag race to a forklift. But it’s reasonably priced, it seems roomy in photos, and it’s probably not that different from most of its competitors. Except blander. So the Jetta is a good car for most people. However, if you have stumbled over the darkest corners of the Internet and found this blog, you’re probably not one of those people. So stay the hell away and buy a used WRX instead. 170 hp/177 ft-lb 5-banger BTW…but as noted, you didn’t drive it (or get into it). Good assessment and you are correct that it’ll cut down on the usual number of hot chicks driving VWs. I like the 2.5L 5 actually…interesting power and torque curve. Kinda like a gas-powered diesel. I am a man. I loooove my MkIV VR6/6-spd manual. Am I confused? Sometimes. The Mk III Jetta wasn’t Brazilian crap; it was Mexican crap. The Brazilian crap was the Fox which is mostly what VW dealers had to sell in 1993 when the Mexican factory couldn’t figure out how to build the new Jetta. Can’t wait to read the “Car Review Without Actually Driving It” of a supercar…. As a male owner of a 2013 Jetta TDI I have to address this. Why would a male car enthusiast buy this car? 1. I have a family and it’s just about the only “compact” car (really more mid sized) that can fit a rear facing car seat. 2. It’s a diesel that gets about 50 mpg highway in real world driving (Obviously this review wasn’t specifically about the TDI but should have mentioned it). 3. It has three pedals (6 speed). 4. It has ridiculous amounts of torques for what it is. 5. As you sort of said, its no longer a girls car. 6. With a tune you can produce over 180 hp and well over 300 lb-ft of torque which can give you more fun than almost anything else that works for a small family. 7. The handling is OK (vs. very bad in some of the competition). Buying a Jetta is certainly a compromise for an enthusiast but sometimes you have to be practical. 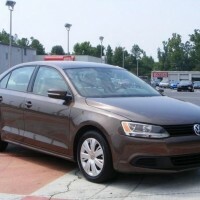 Just curious, what other cars did you consider when you purchased the Jetta? 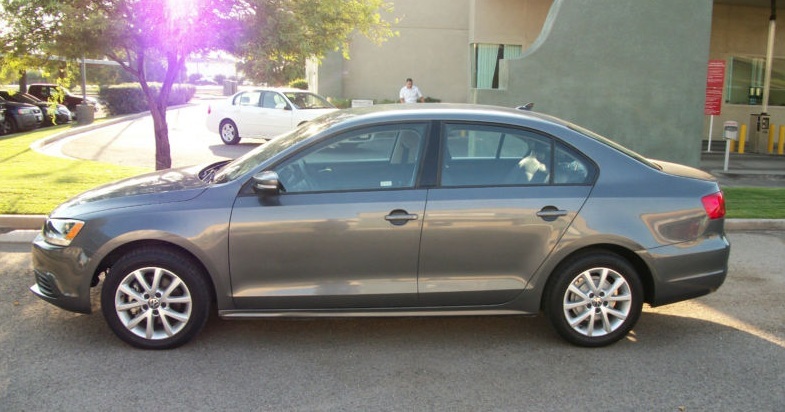 I looked at a Dodge Dart, Mazda 3, other VW TDIs, and a few others. MPG was a big motivating factor I had to use to get the wige on board (which unfortunately eliminated the Mazda)There were some others but I’m drawing a blank. Oh my, I just discovered this feature, and I have to say, it is hysterical! I would love to see you do more of these! I actually think the current gen Jetta is a good looking car. Simple, but “handsome”. Unfortunately, I made the mistake of opting for one when I was renting from Enterprise (over a Ford Focus sedan). Huge mistake. Not only is the base 4 woefully underpowered in 2014, but even the build quality you assume is there from 10 feet just isn’t. Any panel that could be misaligned was. The interior felt super cheap, although the seats were decent. In the center console (where the armrest should’ve been), there was a black piece of roughly cut felt with white stenciled lettering that said “Jetta Basica Hecho en Mexico”. Not that there’s necessarily anything wrong with Mexican built cars, but I sure wouldn’t want my country associated with this POS. And halfway through my rental when I was driving at night in the fog the car’s flashers went off and the horn started blaring. Weird since it didn’t even have an alarm system. The car only had about 5k miles on it. About the only thing it had going for it was that the base model Jetta uses good old hydraulic steering. Which had me fantasizing that maybe BMW would do something similar to “cut costs” with its basic 320. They’d probably charge more for it though. Previously, i’d actually been toying with the idea of a GLI, but after this experience I’ll pony up for a stripper 3 series instead.